Whether you are a fan or not, everyone has heard of Star Wars. 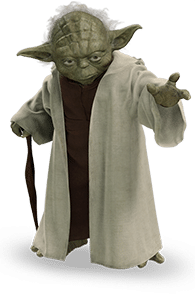 A very wise Jedi by the name of Yoda is responsible for many quotes which make a lot of sense when applied to our careers and daily work lives. Being quotes from a science fiction story, some are to the point, while others are a little more vague, allowing individuals to interpret them differently, depending on their own lives. Wading into office gossip or politics, with more rumors or opinions, is not a particularly great strategy to further your career. You’re not an office gossip are you? You should be able to rise above this kind of behavior. This quote could also be understood to mean that we should have the courage of our convictions. Be confident to offer your constructive opinion and engage with others to get a job done. If we start out on projects or tasks thinking “I’ll give it a try” then we are already doubting our ability to complete the task successfully. Having confidence in your own abilities and being seen to be positive will be of great benefit to yourself, and those around you. Positivity and confidence are ingredients for success. OK, so chances are that you probably won’t be converting to The Empire anytime soon, but do not be afraid to try new things and put yourself in uncomfortable, challenging situations. It is often the case that putting ourselves forward for a challenge that stretches our abilities will result in our personal and professional growth. If we never stretch ourselves, then we never improve. Being seen as someone that accepts a challenge will stand you apart from the crowd. Sometimes it is necessary to see things from or someone else’s, or just a different, perspective. We may believe that we know the best, and that our way is the only way to complete a task properly, but this does not mean that there isn’t another equally as good or even better way, of doing it. It is better to listen to others suggestions than dismiss them without consideration. Negative colleagues are a drain on morale and productivity. Often these people are all too happy to moan about a situation without ever contributing suggestions on how to resolve or correct it. Try not to get caught up in this negativity, and be seen to be the person proactively trying to resolve whatever issue or challenge is presented. Sharing your knowledge and experience is a great way of building a team environment and also increasing the knowledge of others. Successful inductions often involve a mentor from within the business to assist new employees during their probation. We can’t see what’s around the corner, or where we will be in a year’s time. But we can make the most of the present and give 110% to our personal and professional life. Taking shortcuts and trying to ‘muddle through’ is not a good strategy in business. Being prepared, thinking things through and learning from our mistakes are of key importance to successful business. Sometimes risks have to be taken to better ourselves. If you believe the benefits outweighs the risks, and that you can achieve your goals, then you should believe in yourself, and go for it. Everyone has their own point of view. Different people believe different things. Respect and cooperation are vital to a successful office environment and productive company.